“I didn’t even remember writing the letter, but it’s all turned out spot on”, the recent MBA graduate, who completed his studies in the summer, refers to the letter the participants wrote to their future selves at the beginning of the studies. Kai Rönnberg had written down six wishes and has taken major strides in all six areas. The last wish was the most important; he wanted to take a new step in his relationship and life. He celebrated his wedding in Finland in the summer. The young couple has now returned to their work and lives in Australia. Rönnberg answers the phone in Brisbane, where he is attending a mining conference to hear the latest developments in the sector and meet clients. It has been two years since he began his MBA studies along Mechelininkatu street in Helsinki. He still works for Outotec, heading Services in the region of South East Asia Pacific. The original plan wasn’t to take part in studies jetting between Helsinki, Sydney and Singapore while getting to grips with a new job, country, home and even hobbies. Rönnberg praises Aalto EE for its flexibility and gives a firm piece of advice to anyone thinking about taking part in the studies: “Waiting for when you think you have enough time will never come. If you are interested in an MBA or EMBA program, you should check the content is a good fit for your career and then just go for it full steam”. Rönnberg hoped the MBA studies would give him practical tools he could apply at work. “This was definitely fulfilled. Especially the “tough courses” like Foundations of Finance, International Macro Economics, and Managerial Accounting were invaluable.” Also the leadership courses were useful additions to the toolkit, whereas the Operations Management course left him with a need to find out more. Only one wish was half met, but for a good reason. Rönnberg had planned to take part in trips abroad that were part of the program, which he had to skip when he took on a new position at Outotec Australia. Instead of student exchanges, he swapped home countries altogether, and badminton gave way to surfing. 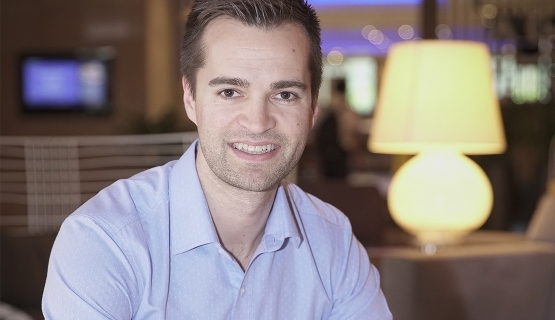 “Without a supportive employer, it would have been difficult to complete the studies”, says Rönnberg, giving one more tip for MBA and EMBA students: “Be open about the studies at the workplace. Talk about your plans with your employer, and together think about ways they can support your studies and make use of the new competence in the future.” In each interview for the MBA journal, Rönnberg has mentioned lessons from the courses and modules that he has passed on to his workplace. Dusk is beginning to fall in Brisbane, and Rönnberg has some networking to do at the evening event. He will be returning to Sydney the next day, with Australian springtime to look forward to ahead. The MBA journal has reached its end. Rönnberg’s CV now includes the words Master of Business Administration, and a square cap awaits the next time he visits Finland. Kai Rönnberg has the position of Vice President, Services, South East Asia Pacific at Outotec. He began his studies on the Aalto MBA program in early 2016 and graduated in the spring of 2018. The MBA journal has followed his thoughts and experiences along the way. All journals can be found below.